This circuit divides a 10 MHz reference to 1, 10, 100 or 1000 pulses per second. The pulse width is also jumper selectable with lots of choices. A sync input will align the pulses with an external pulse, say from a GPS receiver. The outputs are hiding over there at pins 8 and 9 of the '7474. 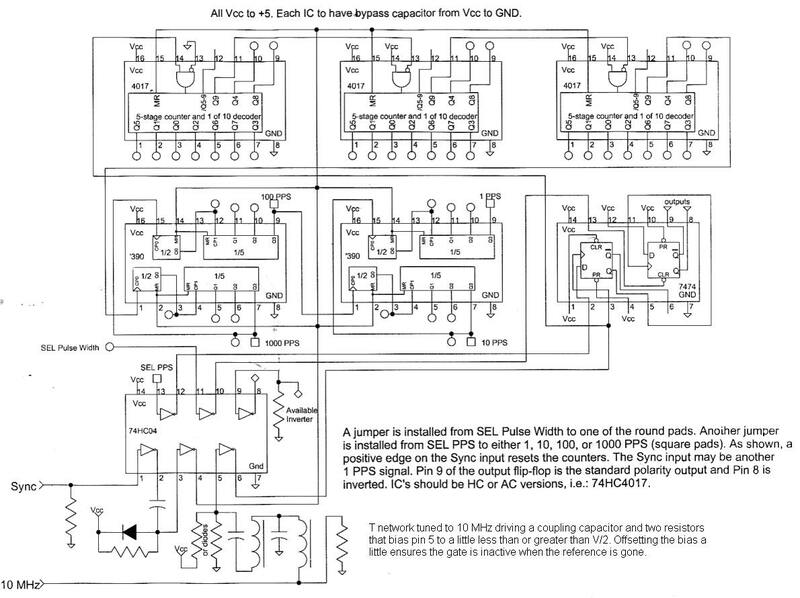 The input is at the bottom of the schematic and is really just a sketch of a typical sine-to-square converter. Those parts aren't on the prototype in the photo. Just use a logic level directly into pin 5. A line receiver is a good way to square up a sine wave, too.